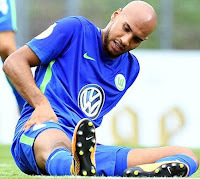 Well, the news just got worse for John Anthony Brooks, Wolfsburg, the USMNT and anyone who knows what a torn thigh tendon feels like. Sweet Moses, that sounds extraordinarily painful. So, yeah, he will definitely miss the last four World Cup qualifiers. Big fat blerg. Is it Besler time? Does Gonzo slide over to the left? Will we finally see Opara? Does this increase the likelihood that Arena returns to a three-man back line? All of the above? Arena has worked with Tim Ream before, hasn't he? Seems like the guy to plug in there next to Cameron. @reanalyst - All we are saying, is give Ike a chance? I want Miazga called in for meaningful minutes. He's ahead of Gonzalez in everything but experience, IMO. Besler, Ream, and Gonzalez are obviously the most direct picks in a WC year, but I want to see if Miazga can limit the mistakes and be part of serious victories. I won't get my wish, probably, but he better be in every camp.